The Rhinos Snorting Drano tutorial was a lot of fun to put together. First of all, I’ve always been intrigued by the name of the weave. I don’t know where it came from, but you have to admit, it’s unusual! So how do the rings stay in place without going through another ring? In a sense, these are captured rings — in other words, other rings hold them in place. 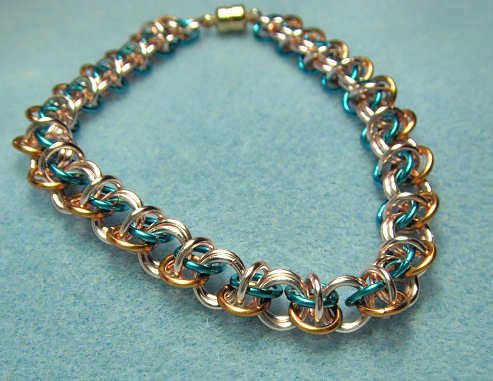 Typically, orbital chainmaille jewelry patterns are indeed chains as opposed to sheets (although almost any chain can be made into a sheet). And Rhinos Snorting Drano of course falls into that category. But Rhinos Snorting Drano isn’t just one weave; with a few tweaks, you can have different looks. The Barrel pattern is one variation, which when done in a tighter weave is quite a tailored look. Just what will you learn in this tutorial? Here is a sampling of what is in store for you. 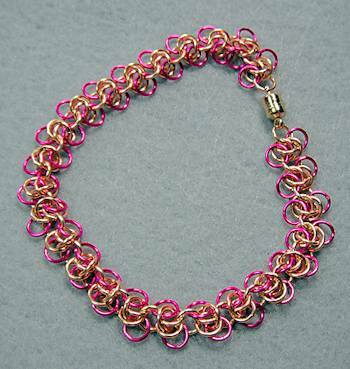 Rhinos Snorting Drano – This is the base weave for the chainmaille jewelry patterns, from which the other weaves are derived. Barrel – This is the first variation of the RSN weave; in it, you will also learn an alternate way to make the RSN pattern. Plus all the standard information like jump ring size, appropriate ARs, supplies and even an appendix with a refresher on a basic technique. For the Rhinos Shaken Not Stirred, I also show you examples made in other ring sizes, gauges and colors so you can get an idea of what you can do with it. The tutorial is in the form of an ebook (.pdf file). It has 20 pages and 35 photos. You get a lot of very close-up photos so you see exactly where each ring goes, as well as written instructions. All you need to do is click the “Add to Cart” button. The tutorial is in ebook form — it is not a printed book. Because of the nature of the tutorial, I don’t provide refunds, but I do my very best to over-deliver for you. The tutorial is immediately available as a digital download. This means that whatever time of day or night, you can download a copy — no waiting! So get your Chain Mail Tutorial for the Rhinos Snorting Drano weaves for just $5 and you can be learning in just a few minutes. Enjoy!!!! !